We had a change in pace and scene today by going to tourist attractions before beginning the Columbia University Model United Nations Conference and Exposition (CMUNCE). First off, we went to a memorable part of New York: the 9 / 11 Memorial and 9/11 Memorial Museum. While many of the Delegates would have only been one year old when the tragic event occurred, it was important to remember back to the events of 9/11 and see how this affects the United States of America’s foreign policy. Delegates respectively observed the memorial footprints of where Tower 1 and 2 once stood and felt it was a heavy place to be. The structure of the memorial looked like “”an attempt for the the water to wash away the tragedy”. Yet, in the actual museum, there were exhibits about the victims which lent insight into their full lives before the tragedy. After our solemn visit, we headed to the warmth of the Pret a Manger – a favourite it seemed among the Delegates. After this, it was voted by the delegates that they would visit the iconic Charging Bull sculpture outside Wall Street. The Delegates were surprised at how busy the tourist area was but it was a grand sight. Next on the agenda was a trip to see a snowy Central Park. For some of the delegates, this was the first time they had seen a squirrel. Although Central Park was not as busy as it usually gets in summer, there were still a lot of people walking their dogs around. The final tourist experience the Delegates were given before they began CMUNCE was to go to an American Diner for dinner. 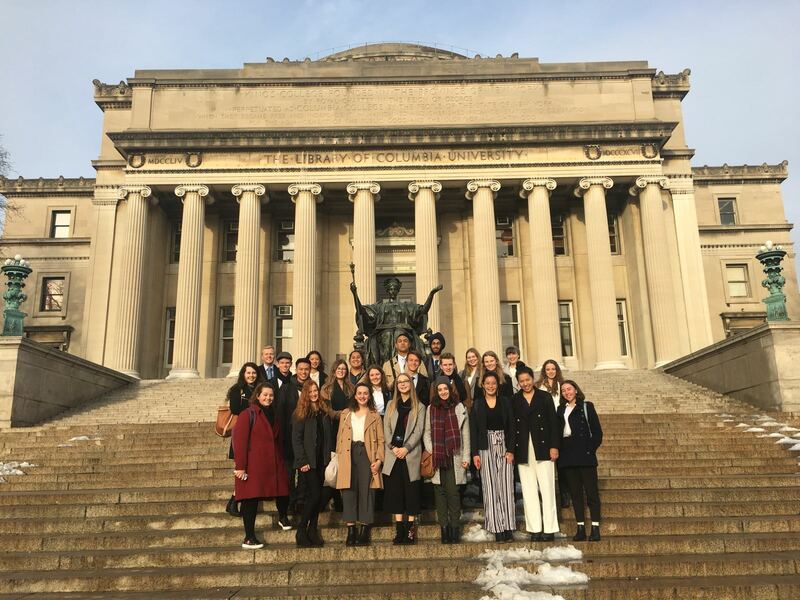 Before arriving at Columbia University for CMUNCE, it was clear that Delegates were feeling excited and nervous about the event as well as meeting American or other international students. But at the Opening Ceremony, the Delegates had the opportunity to hear the key note speaker, the Special Representative of the International Criminal Police Organization (INTERPOL) to the United Nations, speak about the relationship of INTERPOL and the UN. Delegates then went to their First Session which they felt they were well-prepared for since our CMUNCE simulation at December Planning Weekend was fast-paced after introductions in the Committee. However Chairs of Committees were very relaxed and set the tone that it was quite a relaxed process so there was a good balance. Delegates were surprised that other students were delighted to hear the Kiwi accent and to learn more about New Zealand and UN Youth NZ. One of the highlights of the first session of CMUNCE for one of our Delegates, Sarah Cameron, was that she put forward a Directive which had more than the number of signatories required.